Takeaway: Even on the 2Q blow-up, expectations are too high, and KSS is still a short. Conclusion: Overall, a weaker quarter than even we expected for our top Short in retail. 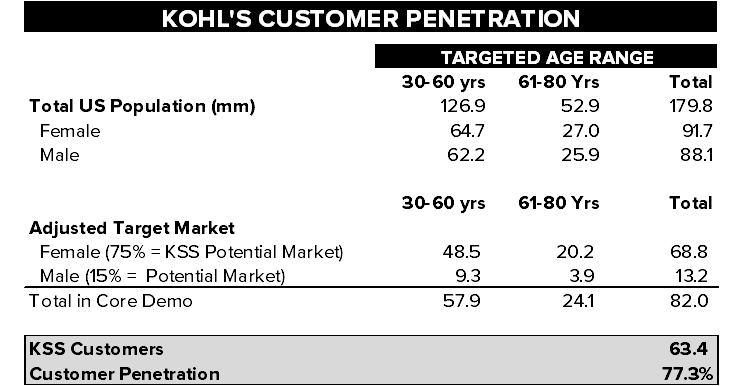 While few people would argue that Kohl’s is a great business, we remain convinced that there are underappreciated risks (even to most bears) to this model that will keep the company’s realized earnings power below $4.00 – pretty much forever. That’s notable when the Street is building up to a $6.00+ EPS number over three years. That’s not going to happen from where we sit. 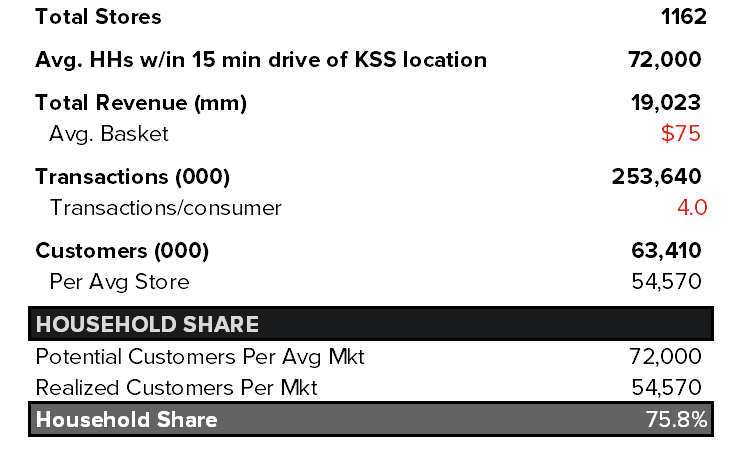 Specifically, KSS has reached a pivotal point in its maturation cycle where it has already captured 75%-80% of all customers that could potentially shop in a Kohl’s store (see analysis below). Strip malls were once an alternative to Regional Malls, which is how and why KSS was born. Now there’s this thing called the internet that’s a better alternative for consumers to go direct for premium brands. Online growth for KSS is 1,000bp margin dilutive as its basket size is too small to absorb shipping costs, which is increasingly used by competitors as an offensive weapon. So the company is fighting hard – to its credit – to battle this trend. But it is a fight it cannot win. As such, growth is getting expensive. The company had to launch its Y2Y rewards program because neither Chase nor CapitalOne would flex FICO standards any more to go further down the consumer food chain to win new KSS customers. With Gross Margins in a secular decline due to e-commerce, and SG&A climbing steadily due to less credit income (which serves as an offset to SG&A, and is 25% of EBIT), we need to see the revenue line consistently grow in the mid-single digits to make the financial model work. That’s unlikely to happen even in the best economy. There might be flashes of brilliance from time to time, as all retailers have, but by and large, this model is a flat-out fade. And unlike other retailers like Macy’s, there’s no real estate value to speak of. Here are some of the things on the quarter that concerned us (we’d list positives too, but there really weren’t any). Credit penetration was down 171 basis points vs last year, with sales from Kohl’s card members down LSD in the quarter. This is one of the major risks we highlighted with new customer acquisition under the Y2Y program, in that a person can get the same benefits as a KSS card holder, but buy merchandise and pay for it with their Amex, Visa, or whatever card instead of being required to use the KSS card. KSS will still get the sales, but will forego the credit income. Again, that’s 25% of EBIT at risk. At the same time, KSS’ guidance for 2H suggests that SG&A is trending at the higher end of its range. Note that as credit income slows, it exposes the real growth in underlying cost structure. 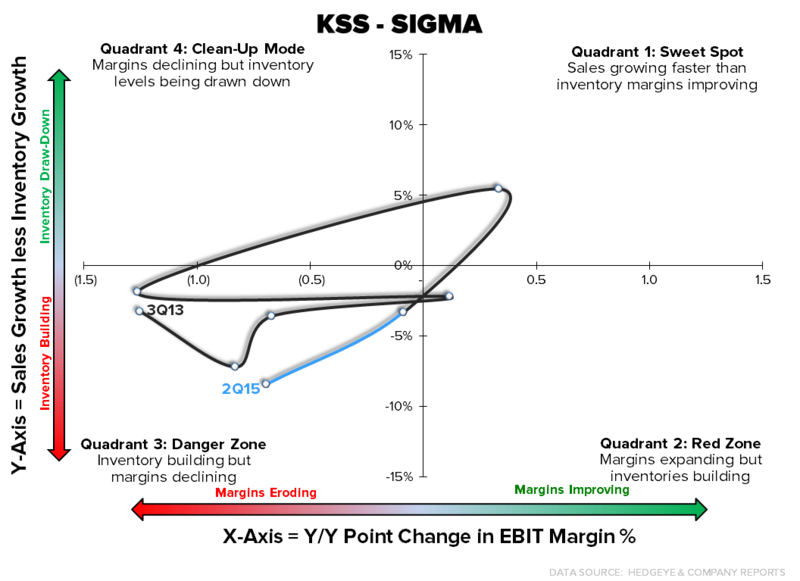 On one hand, KSS comped positive, which is well above the -1.5% we saw from Macy’s. On the flip side, it was only +0.1%, and it needs to be on a ramp (with a very short slope) to 2% in the back half. That includes 4Q, where KSS is going up an un-KSS-like comp of 3.7% (the number that started the rally from $56 to $79). Comping against this will be extremely difficult for KSS. 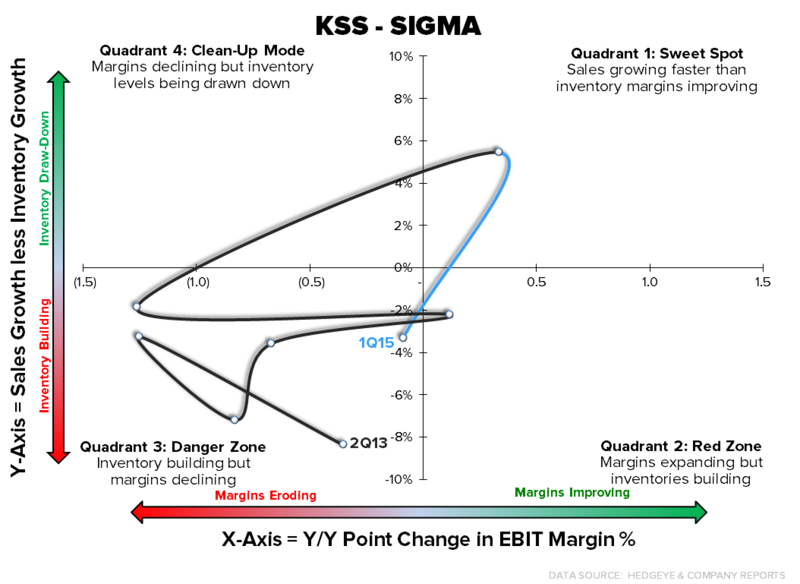 If there’s any way KSS gets the comp, it is because it is sitting on too much inventory – which was up 9% for the quarter on only a 1% sales increase, marking its second consecutive erosion in the SIGMA trajectory (below). The company tried to explain away its oversized position with $120mm in early deliveries making up 5% of the 8% unit jump. But management admitted a portion being due to lower than expected sales and also having higher clearance inventory. Takeaway: Headline may be benign, but a lot in this print should support our Short. We maintain our view that annual EPS likely to never grow again. Conclusion: KSS remains our top short. Do we think that the wheels will completely fall off the story with this Thursday’s print? No. But we don’t think we’ll see any notable upside, and we expect to see key metrics erode in support of our bigger call on the name that annual earnings are likely to never grow again. To put that into context, we’ve got numbers between $3.50-$3.75 from 2016-18. That’s 40% below the consensus, which has earnings marching over $6.00. The stock may appear cheap to some at an 11% FCF Yield (the most common bull case we hear). But we’d argue two things…1) while numbers are coming down, department store yields have gone well above 20% (just ask Dillard’s), and 2) our model has a lot less margin and cash flow, and only a 6.5% FCF Yield at $3.75 in earnings. Lastly, unlike with Macy’s and Dillard’s, there is absolutely no real estate play with KSS. So when all is said and done, we’d be short KSS into this print, and if the company throws the bulls a bone – as it does from time to time – then we’d get heavier on it. This is as much of a ‘core short’ as we can find in this market. The only way we expect to see the recent positive trend in store traffic to continue is if KSS gives it all back in lower merchandise margins. The only comp we’re likely to see will come by way of e-commerce, which is GM% dilutive by 1,000bp. Combining those two factors, we can’t reconcile how the Street could be looking for a 20bp improvement in GM% y/y. We’re also looking for growth in credit income (25% of EBIT) to continue to slow due to cannibalization from its Y2Y Rewards program, which should lead to contraction in its biggest profit center by year-end (without having to make a call on the credit cycle). There’s no real guidance one way or another with KSS, so it will be interesting to see how management handles Revenue expectations for 2H. The consensus is looking for an implied underlying comp acceleration from -1% to +3% over just two more quarters. That’s BIG for a company like KSS. Comps Get Tougher. The sales line should be the biggest ‘driver’ of this print on Thursday (with the caveat that earnings are really not growing). Expectations have come down considerably since 1Q where the buy side was looking for 4%+, and Consensus has walked numbers down from 2% (10bps lower then where it sat before the 1Q print) to 1.5% over the past month which helps explain the 5% sell off. The 1.5% seems achievable from where we sit, but assumes a positive 2yr comp -- something KSS has only printed once in the past 9 quarters (4Q14). 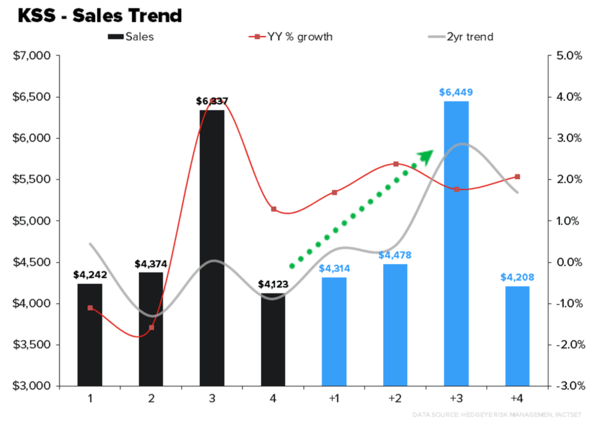 Then, comps get much tougher for the company with current consensus estimates assuming that the company accelerates sales sequentially on a 2yr run rate from the -0.9% number reported in the first quarter to 2.8% in the 4th quarter. We don’t believe that KSS’ current arsenal of sales drivers: personalization, loyalty, beauty, BOPIS is enough to reverse the 3yr trend of negative store comps. If KSS has anything going for it this quarter, it’s that e-comm comps were extremely easy in the months of May and June (at 15% vs 30% in July). But, the company lapped the same benefit in the first quarter where comps were 12.4% and failed to realize the benefit. Traffic rank numbers which take into account both unique visits and page visits per user ended the quarter up in the mid 40% range, a slight acceleration from what we saw in 1Q. But, what we think is more notable is a) the accelerated ramp of JCP which is a big deal considering our works suggests that KSS was the biggest beneficiary of the JCP market share hemorrhage, and b) the relative underperformance of M compared to the group. Management’s bull case for this year was predicated on improving merch margins due to tight inventory management. 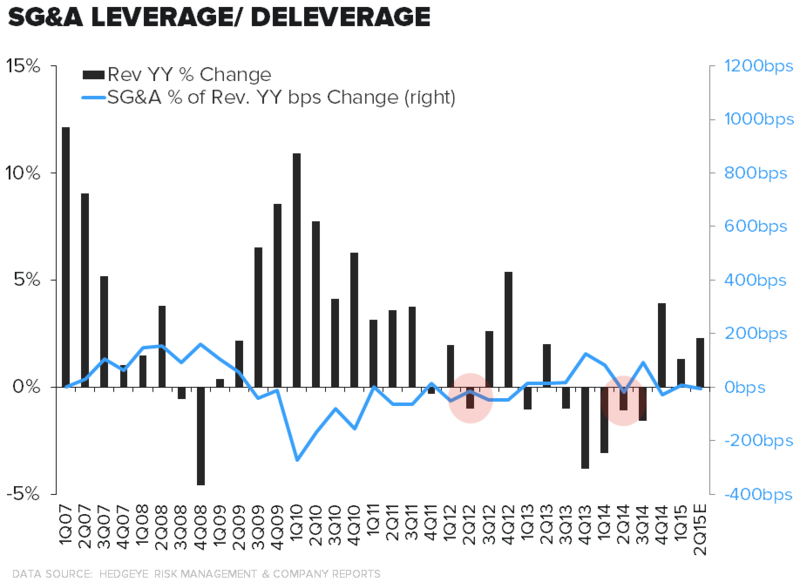 That was well and good when the company entered FY15 with a sales to inventory at a favorable 5% (the first positive spread in over 3 years), but the SIGMA trajectory inflected in a meaningful way to the downside headed out of 1Q against the easiest comp of the year. That almost never equates to a positive gross margin event. Management tried to downplay the margin headwind of 5% inventory growth by calling out the growth in National brands which carry a higher AUR (units per store were up 1% vs. last year), but that also comes with its own margin pressure. On the DTC front, e-comm caused 42bps of dilution in the first quarter, and assuming a 20%+ growth rate in the DTC channel (which the company no longer discloses) that amounts to 30bps of headwind for the year assuming of course that there is no further deterioration in e-comm gross margins. That’s a big hit for a company like KSS to handle especially when you consider that the company started this new rewards programs which equates to 5% cash back, National Brand penetration growing (a conservative 4bps to 7bps of headwind for every 100bps of mix shift), and the current inventory position of the company. Credit was a 13mm (70% of the dollar decrease) benefit in 2nd quarter of last year, that’s slowed over the past two quarters to 1mm and 2mm, respectively. We think that continues to march lower as the Yes2You rewards program continues to curb credit portfolio growth. 2Q14 was just the 2nd time in the past eight years that the company leveraged SG&A expense on a negative sales number. Employment costs are headed nowhere but higher. KSS management seems to be in denial about the added pressure from two of largest players in the retail space raising wages to $9, but the way we are doing the math by extrapolating the guided WMT cost pressure to the relevant number of KSS employees we get to 60bps of margin pressure and a $0.35 (8% hit) to earnings. That hasn’t manifested itself yet, and probably won’t until the retail hiring season kicks up in 3Q for BTS. No matter what the company prints on Thursday, it’s pretty clear that the company won’t make any material changes to its FY guidance. The company updated its guidance policy last year, and noted that it would only update its Fiscal year numbers once in the 3rd quarter. There hasn’t been a lot to like on the Management front at KSS over the past few months. First, KSS ended its 14 month search for a new Chief Merchant when it decided to add responsibility to the plate of Michele Gass current Chief Customer Officer. With the entire global retail industry as a talent pool to source this position, Mansell picked the person who said very explicitly at the Analyst Day in October that 'love' would drive the business -- not once, or twice, but 19 times. Also, being a Chief Customer Officer (something that has no P&L responsibility or accountability) has nothing to do with being a Chief Merchant. This one will be hard for the bulls to defend. And more recently, the company’s CIO, Janet Schalk, ended her 4 year tenure as CIO and jumped ship to Hudson's Bay citing a ‘great deal of uncertainty’ over the management transition taking place within the company centered around the hiring of a new yet to be named COO.